Already a member? Open OnTarget Nutrition | Not yet a member? Try it FREE! Food Tracker - Nutrition Calculator - OnTarget Nutrition. The food tracking, weight loss, and nutrition site. The interactive diet tracking calendar makes it easy to get started - Simply click a date to enter your weight, foods, exercise, notes, and more! Track calories and nutrition in real-time. Add your own foods and recipes. Customized for your weight goals and nutritional needs. CNN-Health - "OnTarget Nutrition delivers results." 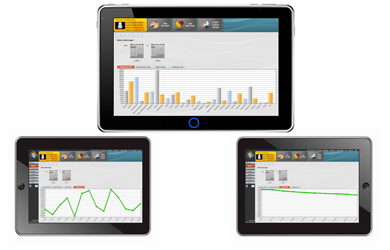 Track your foods, daily weight, exercise, notes, and custom data all in one easy, yet powerful, view! See your daily food intake summary in real time. Detailed nutrition labels for all foods and recipes. - "Keeps you mindful of every mouthful." Log your exercises and they are automatically calculated into your caloric balance. Choose standard exercises or quickly add your own custom exercise to improve mood. MSNBC - "OnTarget Nutrition is a pleasure to use." Track progress from starting weight to target weight. 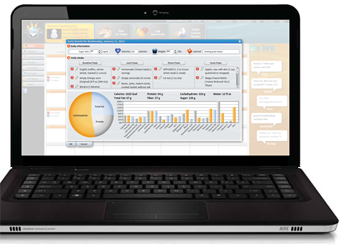 Track stats important to you such as blood sugar, blood pressure, and body measurements. OnTopic Community - Stay Motivated & OnTarget! Find support, share encouragement, and chat about healthy tips. Receive one-on-one feedback from real fitness and nutrition experts. Food Tracking & Weight Loss Made Simple! 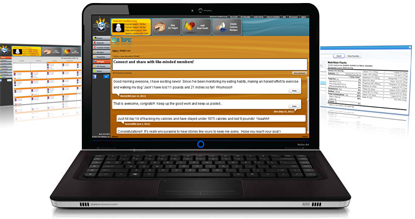 Add your own homemade foods and recipes. Share foods and recipes with thousands of other members. 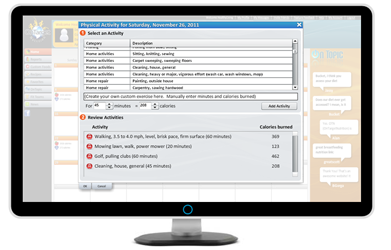 Create custom exercise and fitness activities. Easily track calories burned and your daily calorie target. Chart weight goal success with weight tracking charts. Track custom data such as body measurements, glucose levels and any other value you prefer. Connect with friendly members that share similar goals and challenges. Find support and share tips to stay motivated and On Target! OnTarget Nutrition is a premier food tracker, nutrition calculator, and calorie counter! More than an easy-to-use weight loss tool, our food tracker helps you balance your diet and improve your health. We are all too familiar with the never ending diet fads that require us to follow their exact rules and severely limit food choices. OnTarget Nutrition is different. Our diet tracker works for you and fits into your lifestyle. Eating what you enjoy is important for long term weight loss - we understand and embrace this. Our food tracker focuses on helping you find the best foods in your own diet so you can make positive changes to reach your weight and nutrition goals on your terms. Diet and food tracking is a critical component for successful, long term weight loss. Several studies have proven that using a food tracker can double weight loss success compared to not actively tracking one's diet. It’s simple, the more you track your calories and food, the more likely you lose weight and successfully keep it off. Combining the benefits of keeping a food diary with calorie counting and nutrition tracking offers a recipe for success. Lose Weight: Set short and long term weight goals based on your personalized diet profile. Meet your daily calorie target to achieve your target weight! Maintain Your Weight (or Gain): Track calories and nutrition to control your weight and meet your nutritional needs. Improve Eating Habits: Make healthier food choices and discover which foods are working best for you and your goals. Increase Energy: Find which foods, meals, and exercises give you the most energy and motivation. Improve Your Health: Manage and monitor health conditions such as diabetes, high blood pressure, and heart health. Track custom data including glucose levels, blood pressure, carbohydrate intake, cholesterol, calcium or any other values you are interested in tracking and reporting. What are members saying about OnTarget Nutrition? At OnTarget Nutrition we know that achieving weight and health goals requires commitment. Reaching these goals is easier when you have the right tools and a proven system that works. Our mission is simple: "Make diet tracking and weight loss as easy and effective as possible." Our overwhelming member success is a solid testament that OnTarget Nutrition really works.